Who says there’s nothing beautiful to see in a winter garden? Every morning, about 90 minutes after sunrise, I am treated to the sight of the sun pouring through the flower heads on the ornamental grass. It is as if they are turned to gold! I never get tired of it. While you are in the midst of this crazy season with all the running around, I hope you can find something to give you the same soul-restoring moment as this grass gives to me. I hope Santa brings all good things to you and your family gatherings go well, filled with good food and good company. This entry was posted in Gardening, General and tagged gardening, general by Carol. Bookmark the permalink. Thanks for sharing the picture. 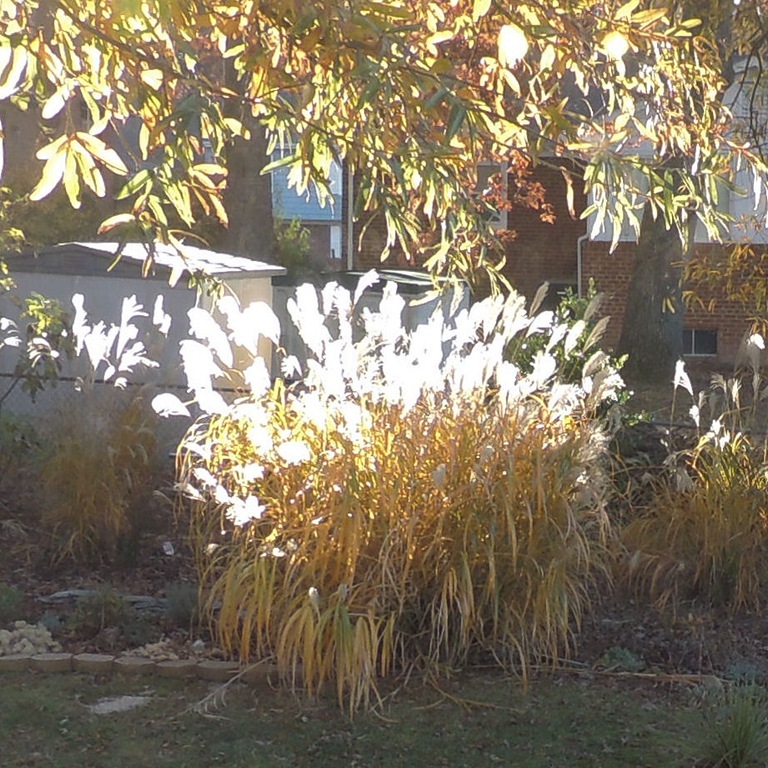 I love the ornamental grasses this time of year. What kind is yours? I knew when I planted it but that was 6 years ago and the little plastic tag is long gone. It is NOT pampas grass which has very sharp leaves. These are soft to the touch as are all the grasses I have planted. That’s such a lovely photograph, Carol. I must admit to being a bit stressed at the moment, so I’ll go and see if I can find my relaxing place. Hope you have a wonderful Christmas. Regards, Dorothy. Carol you are so missed but alas I can come here and read your writing and you are back with me once again! Please leave this website up for awhile. I also really miss Carol and her posts, but like Darla, I enjoy coming here and reading her posts again.